I went to Lidl today and bought some mushrooms. They are now sold in cardboard punnets instead of the blue plastic ones, although it still had clingfilm over it. But it's a step in the right direction, so well done Lidl or the Irish mushroom growers, or both. I was amazed, and glad, to find some tinned foods at T***o are now in cardboard cartons. I wrote a response to this yesterday and somehow lost it! Briefly, having found plastic-wrapped coconuts in the not too distant past, it's encouraging to see any company starting to reduce their plastic use. Morrisons have finally replaced the thin plastic bags for loose fruit and veg with paper bags. They also seem to have more loose produce that isn't more expensive than the plastic wrapped, which definitely a step in the right direction. Going to work, to get money, to translate into things, which you use up, which means you go to work again, etc, etc. What we should be doing is working at the job of life itself." - Tom Good, The Good Life. I've found the alternative for plastic toothbrushes. I've found it on Amazon and purchased it a couple of weeks ago. 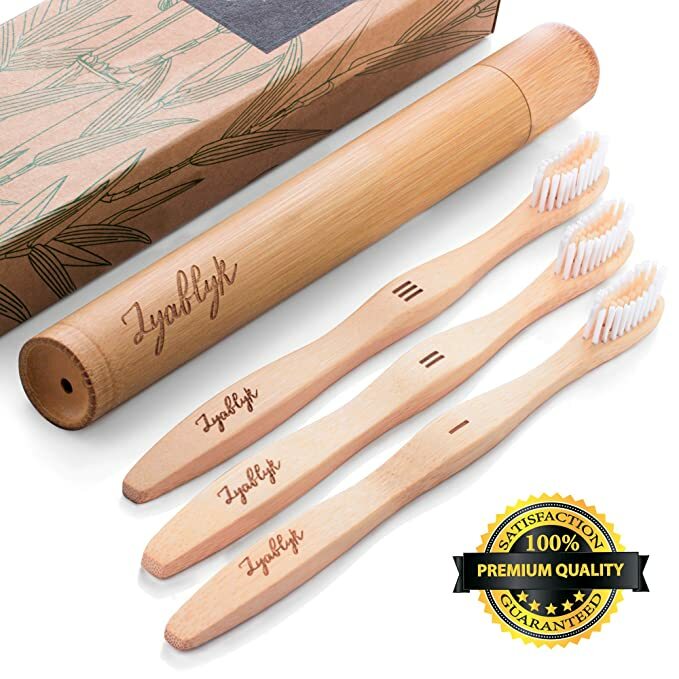 I should say that bamboo toothbrush is amazing! Considering that a toothbrush should be changed every 3 months, it's a good way to avoid the unwanted usage of plastic. When I received the brush even the box was made of recycled paper. You don't need to use horrible Amazon for those toothbrushes - I've bought several in various shops. Hah but have any of you come up with false teeth from the NHS dentist without plastic? I found Bamboo brushes on Ebay recently. Do you foresee scavenging battle fields again Flo? I have no idea what material they were fitted into though. The supermarket I use is gradually moving away from pre-packaged fruit & veg towards simply putting the box full out; unfortunately they still only provide plastic bags to put it in. That is probably because the plastic bags are probably cheaper in bulk than paper ones which get left ripped where the customer is clumsy and uses another one. Anyone seen the fuss over Yorkshire teabags recently? They've tried to produce them with no plastic in them, only for customers to find that the bags split when used in hot water. Sounds like a job for a teapot and strainer. Hmm now there's an old fashioned concept. Perhaps it's one to consider - would require a teapot, strainer and tea cosy here though. Saying that, I use teabags half the time!